All the bitter childhood experiences Richard has got through in his hometown led him to the conception that living somewhere out of there will give him a better luck. He believes that if he takes his mother and brother to move to the North of America, they will get a better life. Also, that means they can be happier than ever. It is because Richard always hears so. He has heard this thing too many times since he was a child that it is shaped in his mind that if he gets out of the racial place he is from, he will have a finer life. Moving to the North becomes a hope of freedom and a better home. Then, that hope becomes a dream on which he needs to work very hard to achieve. Although, in fact, Richard never really has the guarantee that if he moves to North, his luck will be raised up and his hopes for a better life will be fulfilled. He knows neither anyone nor anywhere to go there. The thing he cares about is that he needs to run away to start his life all over again with his mother and brother –his aunt joined them unplanned at the end when they finally move to the North. Richard grew up in a condition that cannot be imagined by anyone. His dad left his family when he was very young. His mother had to work very hard for a living but then she fell sick and could not do anything except lay on bed. That made him feel lonelier. Even when he lived with his big family, he was treated very harshly. The big family could not accept the behavior Richard had, so they ostracized him. He was also pushed to believe in religion meanwhile he did not want to. All he felt was loneliness when he lived with his big family. Outside of the family, life was even worse. The racial condition at that time made him want to getaway from the South. He did not want to be treated unequally. All of the tradition and the people surrounding him disgusted him and made him ask more whys. People told him to behave normally like a black boy, but he was just being himself. What was wrong with being himself? Richard is such a hardworking person. He does not only talk big and dream high, but also act hard. Different with his friends who always says they were going to the North but never really make it, Richard proves that his hard work to move to North is not just a dream. He has tried to save money to be used to move to North. He worked hard since he was child. He also did dirty jobs and crimes in order toget some more money. Some money he got was used to buy food and some was saved. 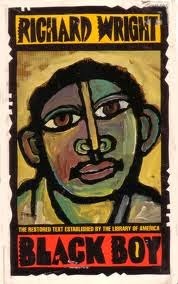 There is a repetition of the term Hunger in the Black Boy book. Richard Wright always says that he is hungry for this and that, and that he always wants some more. It is a symbol Richard uses to represent his American Dream. Hunger has the interpretation that Richard can never be satisfied; that he is always longing to get more than what he is given. It acts like a hope for him for abetter giving. Once he is hungry, he tries to fulfill his hunger; which means his American dream does not stop when he moves to the North.